Still more reactions to the massacre. This topic is continued here from Part 3. The Human Rights Campaign was founded by Steve Endean in 1980. It was one of the first national LGBT groups in the U.S. and is now the largest, with 1.5 million members. 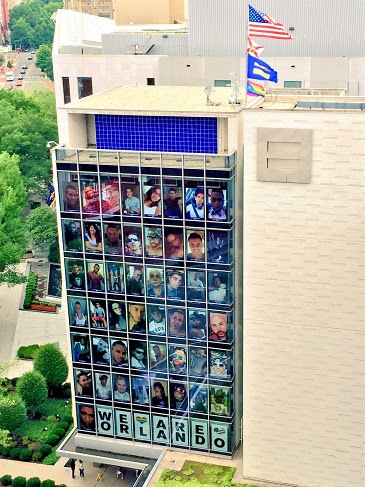 1 They posted images of all 49 victims of the Orlando shooting as a memorial on their office building. Images of the Orlando victims at the Human Right's Campaign headquarters. We’re going to have to do more to prevent these kinds of events from occurring. It’s going to take more than just our military. ... We can’t wipe away hatred and evil from every heart in the world. But we can stop some tragedies. We can save some lives." Senator Dianne Feinstein, (D-CA) proposed a narrowly-focused bill that would deny persons listed on the FBI terror watch list or the federal Terrorist Screening Center's (TSC) No Fly List the right to buy assault weapons. Meanwhile, two amendments from Senator Chuck Grassley (R-A) and Senator John Cornyn (R-TX) would require a three-day waiting period on all gun purchases. The intent would be to give law enforcement sufficient time to check each purchase and have an opportunity to block the sale in court. Senator Murphy's 15 hour filibuster lasted from middle of Wednesday JUN-15 to early Thursday. It was partly successful. It It ended when the Republicans in the Senate finally agreed to actually vote on the bill. During those 15 hours, 38 people were shot across the country, in Chicago, Detroit, New York City, Albuquerque, NM; Austin, TX; Butte, MT; Cottontown, TN; Jonesboro, GA; McKenna, WA; San Francisco, CA, and elsewhere. Of these, 11 people died of their gunshot wounds. There was a miniscule chance that a sufficient number of Republican Senators would possibly ignore the National Rifle Association lobby and their Party's stated position by actually voting along with most Democrats to pass these measures. However, the general consensus was that all four would fail. Even if they were to pass in the Senate, the chance of passage by the Republican-controlled House was essentially zero. "Time and again, we've observed moments of silence for victims of terror and gun violence. Too often, those moments have been followed by months of silence, by inaction, which is simply inexcusable." He asked Congress to reinstate the assault weapons ban which expired in 2004. "We've got to make this clear, constant case that Republicans have decided to sell weapons to ISIS." As expected, most Democratic Senators voted for the four measures, while most Republican voted against them. All failed to pass. In the meantime, Republican Presidential candidate Donald Trump (R) supports the restrictions on gun purchases and wants to meet with the leaders of the National Rifle Association to discuss some form of restriction on assault weapons. 9 This might possibly open a major gap between the Republican Party, their presumptive Presidential candidate, and the NRA. This topic continues in Part 5.